Hello! This week's travel post is a continuation of our fall road trip out west. If you missed all or any of this series of travel posts, you can start reading all about it HERE. The morning of Day Six was very bittersweet for me. On the one hand, it meant saying goodbye to our daughter and the beautiful state of New Mexico, but on the other hand I knew I was finally going to see the gorgeous state of Colorado for the first time in my life. I was really excited about that. I remember as a teenager watching the television series ' Mork and Mindy' and seeing the opening scenes of the show that gave snapshots of Boulder, Colorado and I thought 'what a lovely place to live!'. Of course now, I would think Boulder would be a lovely place to visit, but not to live, because I am so tired of cold weather and snow. We drove like mad to get to the castle by 1:00 p.m for the only tour of the day, only to find out that there were no public tours that day because someone had rented the facility for a special event. To say it was a let down for me would be an understatement. I was so furious with the facilitators of Glen Eyrie because I thought they only do one tour a day, five days a week, couldn't they have scheduled this event one hour AFTER the daily tour or perhaps even on a day they were closed to tours? It was such a disappointment. 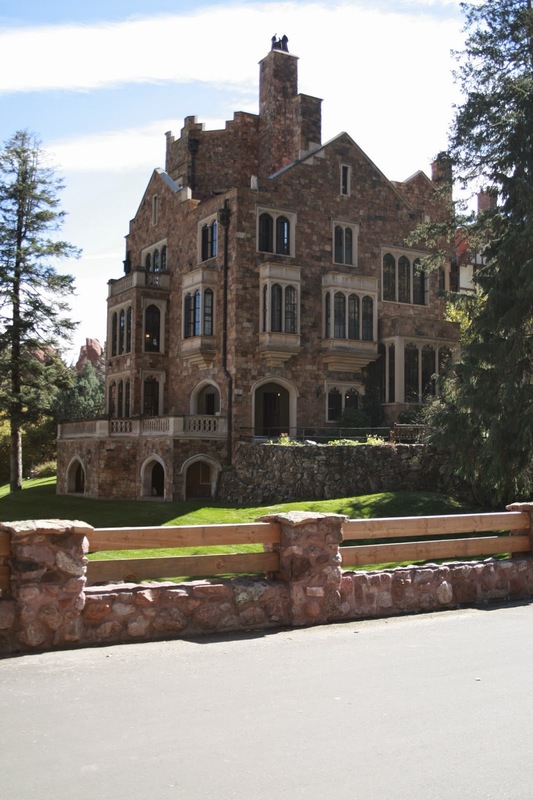 So I have nothing to share with you about the Glen Eyrie Castle other than this picture and to advise you to call ahead for tickets. Nevertheless, out trip to the Glen Eyrie Castle was not in vain, because right down the road from the castle was The Garden of Gods, where we spent the rest of our first day in Colorado Springs. The Garden of the Gods is a FREE public park in Colorado Springs. It is a National Natural Landmark of 1,367 acres of the most interesting mix of landscape I have ever seen. It seems to be a mix of desert rock formations, mountains, and forests. The park is best known for it's unusual rock formations, of which I determined that must be how it got named. I could just picture some Greek God hurling down to earth some rocks landing every which way imaginable. Later I read that the park got named in 1859 when a surveyor exclaimed that it would be a 'capital place for a beer garden'. His companion exclaimed 'Beer Garden! Why it is a fit place for the God's to assemble! We will call it The Garden of the Gods!' and the name stuck. This is the road leading to the entrance of the Garden of the Gods. 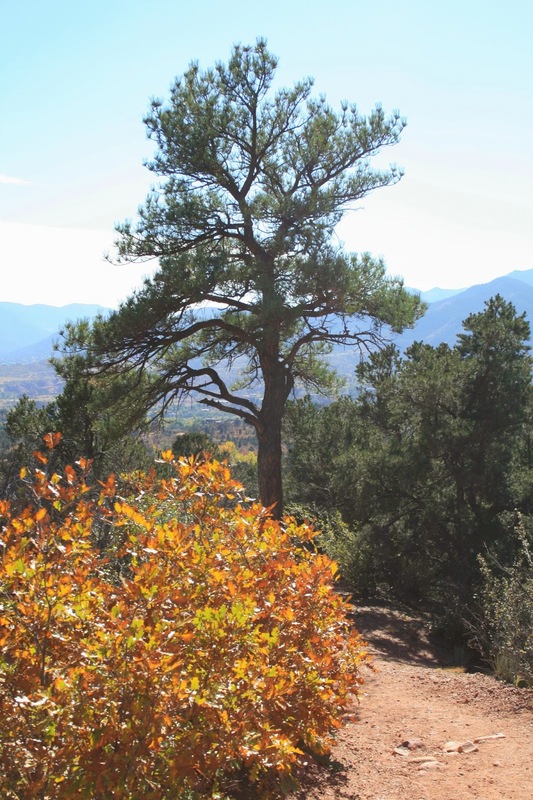 The beautiful white capped mountains in the background are seen everywhere in the park, and the entire city of Colorado Springs for that matter. What I liked most about The Garden of the Gods (other than it's natural beauty of course) was that there was something for all ages and interests. This is a park where you can see just about everything without ever getting out of your car, so the elderly and disabled can enjoy it too! There is also a 1 1/2 mile paved trail that is wheelchair and stroller accessible. They have easy hiking trails for the less adventurous or children, but they also have rock climbing and difficult trails as well. You can also bike ride and horseback ride in this park too. There are many little pull off areas when driving through the park where you can stop briefly to enjoy the view and take pictures like this one. Did you notice what I was wearing in the picture above? I started off my day with boyfriend jeans, a tunic, scarf, and tank top but as the temperatures rose to the upper seventies I quickly started to disrobe as you see in the picture below. 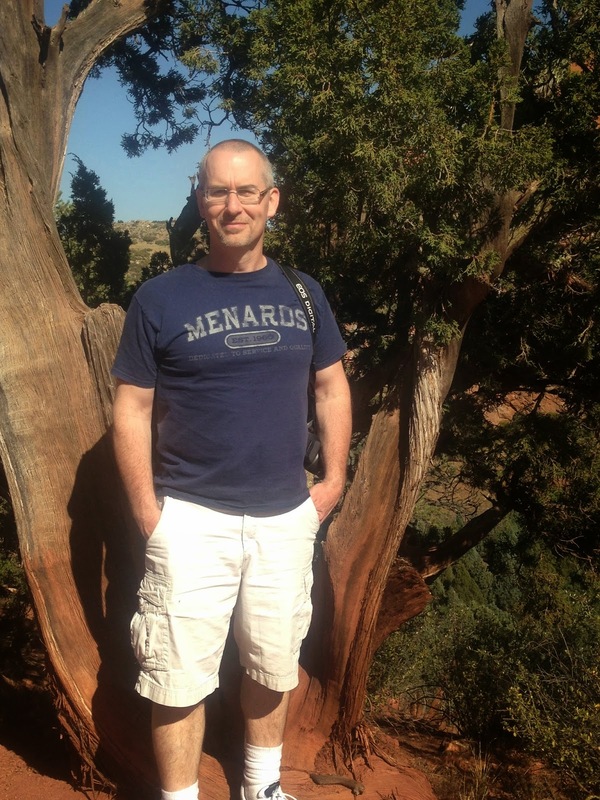 Layers, layers, layers….that's my motto to dressing when traveling! After we drove about an eighth of the way into the park, I was itching to get out and explore a bit on foot. I saw a sign that said 'Balancing Rock' with an arrow pointing to the right. At the time, we thought it was a hiking trail to balancing rock, so we decided to park the car and check it out. We took a lovely red rock trail that went through a little wooded area and gave us some gorgeous scenic views. Of course being there in the fall, we were able to experience some color as well. My husband loved all the interesting tree formations. I loved the constant view of the beautiful Pike's Peak always in the background. After hiking quite a ways up and not coming to anything remotely resembling a balanced rock, I asked some other hikers coming down what was at the end of the hike. They said 'just more gorgeous views, but no rock'. We then decided we must have made a wrong turn, so we turned around and headed back down the trail. The sign was for driving directions to the rock, not hiking directions. It was so funny. You couldn't miss this rock if you tried. The road actually cuts right through it! Of course my silly husband had to play some photo games with it right away. We marveled at how this rocks 'balances' and doesn't tip over. It is HUGE! I loved the little 'window' the two rocks create where they meet. So what do you think of this view? Breath-taking isn't it. I remember how wonderful I felt when this picture was taken. The weather was absolutely perfect, and I loved the feel of the sun soaking through my skin. And the view, well, just jaw dropping. The disappointment of not getting to see the Glen Eyrie Castle was quickly forgotten by now. The Garden of the Gods is a very interesting biological melting pot of America. It has the grasslands of our prairies, the pinion-junipers of the southwest, mountain forests, rocks of the desert, and a 14,115 mountain peak view. A visit to this park, is like a seeing a little bit of America landscape all in one place. Because the park is free, it appeared to me as if locals use it on a regular basis. The city of Colorado Springs is just a hop, skip, and a jump away, so we saw lots of bike riders and joggers in the park. Gees, even I might take up jogging if I had these views to look at every day. Na, I hate to run. But I'd probably hike here everyday if I lived close by. 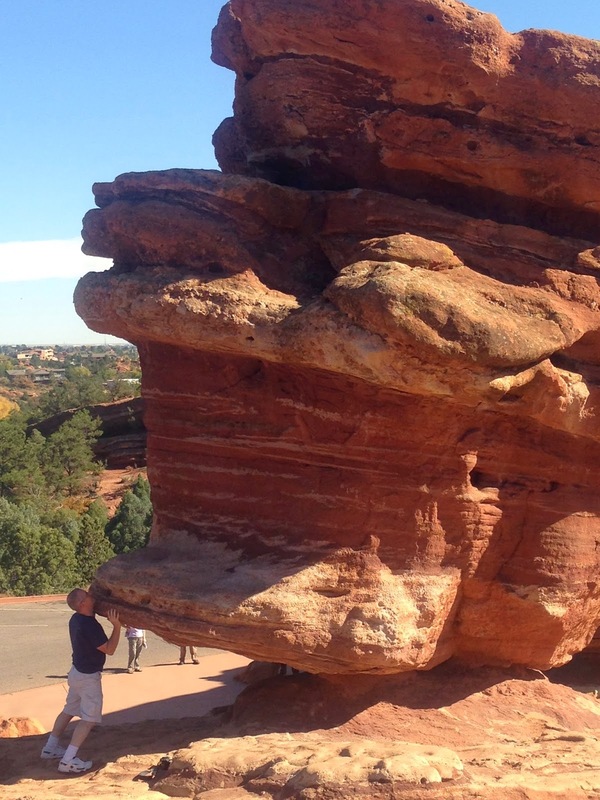 Just like New Mexico, this beautiful red rock was everywhere in the Garden of the Gods. Even the ground was paved with this color. LOVE it! ……..you can't help to believe that there really is a God who has everything under control. What an amazing place to visit Amy! I hope the people living there really appreciate the views they get to see every day! I need to put this on my places to visit list for sure. As a matter of fact I'd love to move there :-) Sorry you missed visiting the castle, this place surely made up for it!